Making Room for New Goodies!! During the last week, I've been working on two new fabric lines that will be coming early next year, and another one that should be arriving next month. That means lots and lots of bolts of fabrics. I need to make room!! 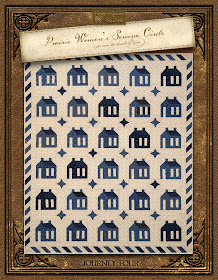 So....in the spirit of black Friday bargains, I've decided to put this Little Blue Schoolhouse quilt kit on SALE!!! Order yours right now.....while supplies last! Regular price is $46 ~ now $23!!! The pattern will also be included FREE!!! The kit includes all fabrics for the quilt top, binding AND backing!! Pattern is FREE!! On this day of counting blessings and giving thanks, we all have much to be grateful for. As I count my blessings, I most certainly count you among them. Writing this blog is a fun way for me to interact with all of you...around the world!! Your comments and email lift my heart and spirit and mean so very much to me. You're very thoughtful, caring and generous! 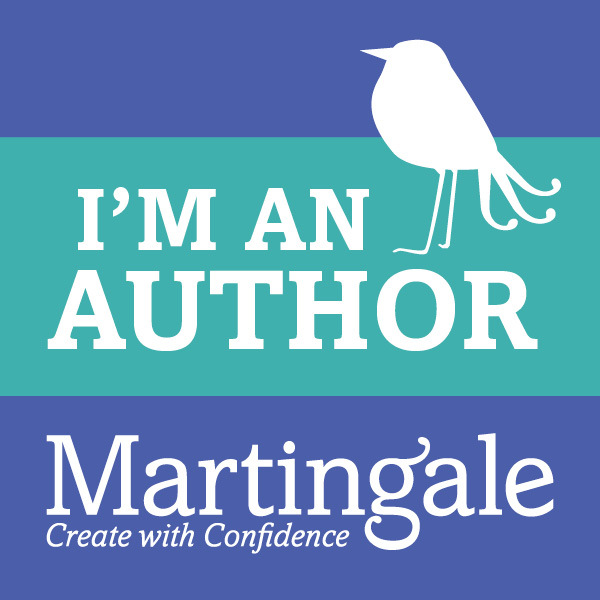 My thanks to you for reading my blog, commenting, and sewing along with me! 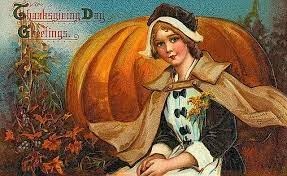 I wish each and every one of you a blessed Thanksgiving holiday! Wow! I really like that block! And all the quilts! Oh my! I needed to wipe a little drool off of my keyboard before I could write anything! B-) ~not glasses, bug-eyes! LOL I love BOM's because they keep me focused and I like the end result of having all the blocks done and a quilt top together. I'm not a big fan of fabric in kits because I have found myself short-changes too many times and I like to make my blocks a little different than everyone else's. That's just me. LOL Thanks for the chance!! 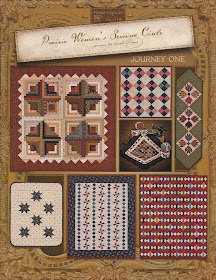 The Authentic Miniatures collection will be in your local quilt shops in January. Click here to see the entire collection on-line. My heartfelt thanks to everyone who left a comment. It's so interesting to read all your thoughts about BOM's. 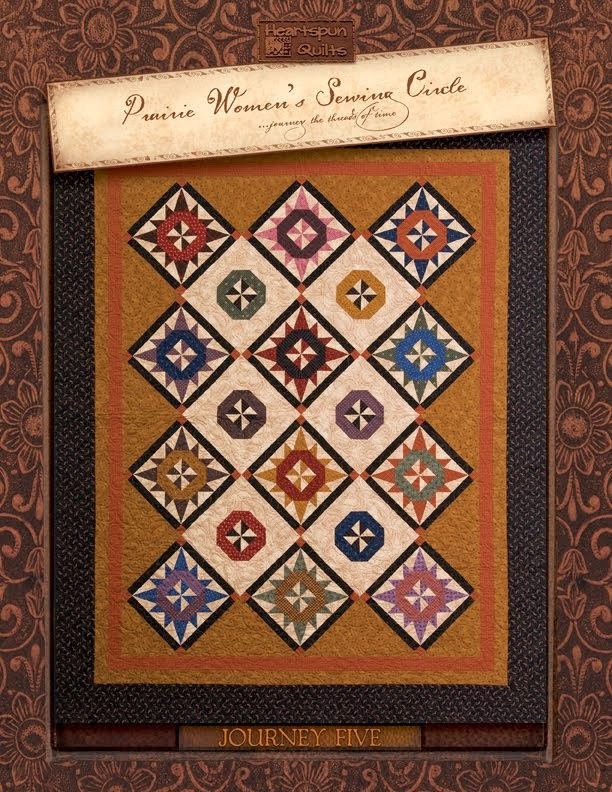 In the end, like Sandie, we're all crazy about quilts, right? And, since variety is the spice of life, there's something for everyone! Personally, I do like BOM's and have participated in my fair share. What draws me to do one is the challenge. 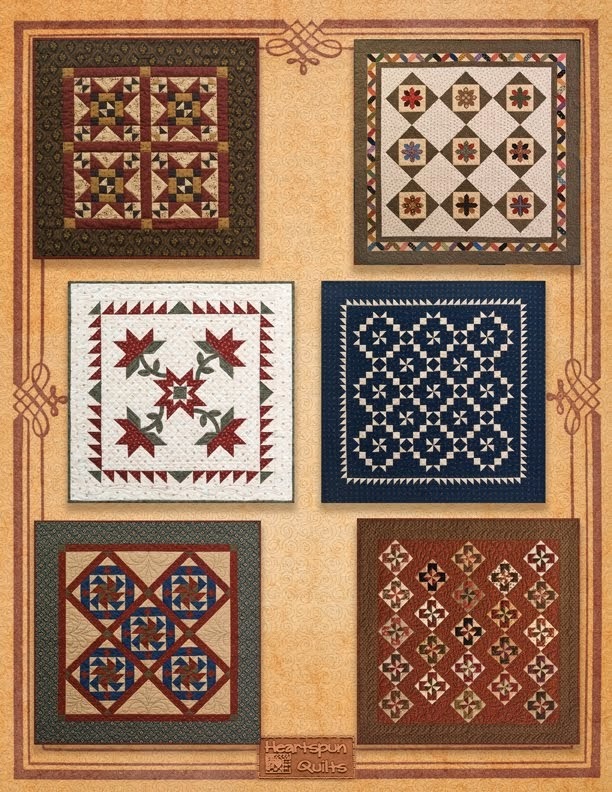 I love a sampler quilt, and the smaller and harder the blocks, the more I like it. I think all quilters love puzzles, and in essence, we all put fabric puzzles together. I have to love the fabrics, too, of course. I'm lucky to have a mighty stash, but that doesn't stop me from joining a BOM. 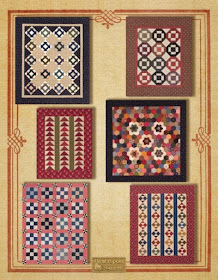 Case in point....I purchased The Cotton Club BOM, designed by Red Crinoline Quilts, because I loved the blocks, the red and brown colors, and all the fabrics. It was a great way to buy and play with every fabric in the line. I also bought the Civil War Diaries BOM (available in 6 inch or 3 inch blocks. Guess which one I'm making?!) 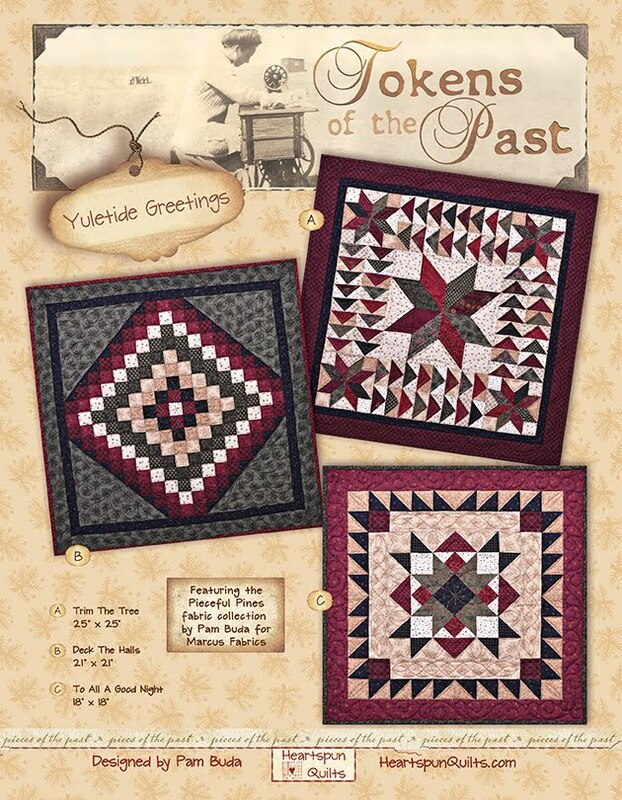 from The Temecula Quilt Company. Shop owner, Sheryl Johnson, does a remarkable job of choosing and pairing great CW fabrics in ways I may never have, and thus, I learn from her. The same applies to shop owner Julie Hendricksen of JJ Stitches. I trust Sheryl and Julie's taste and can't wait to see what comes in the mail! I'm really OK with taking my time to complete projects. Most of those BOM's are in production. You may call them UFO's, but I don't think of them that way. If I get bored with piecing one, then I move onto something smaller, to complete it so I have that sense of satisfaction in between larger projects. There are many quilts that I do as time goes by. No rush....just enjoying the ride. Another plus, I think, is if I've had them for a few years (ah-hem....quite a few to be honest), when I bring them out to work on them, I'm falling in love with the fabrics all over again. When I get one done (and I do complete them eventually! ), they are my pride and joy. Masterpieces, if you will.....and I took my time with them. Like most of you, I have piles of quilt kits. I savor them, knowing they're waiting for me, and will be there when I'm ready. When it's time to pick a new quilt to make, I'm a kid in a fabric candy store! Last Thursday evening, I headed to my local quilt shop, The Quilt Merchant, for a wonderful event to celebrate two special ladies; Judie Rothermel, and Lisa Even, Grand Prize winner of the Just Judie competition, celebrating Judie's 25 years with Marcus Fabrics! Shop owner Valerie Langue (on left) hosted Pati Violick, Marcus' Director of Marketing (on right) and a bunch of admiring quilters for an evening of show 'n tell. Pati came to the shop with a load of quilts....the three top winning Just Judie competition quilts, and a bunch from Judie's own collection, and new Block of the Month quilts from Marcus Fabrics. Lisa Even, of Barrington, IL, holds her Grand Prize winning quilt. The Quilt Merchant sponsored Lisa's entry into the competition. You know how photos of quilts just don't do them justice....well....you can't believe how gorgeous all these quilts really are! Lisa's design and Judie's fabrics came together in a spectacular way! The details and array of color and fabrics are a feast for the eyes! Notice the little Lucy Boston blocks in the corners? Next up was the second place winner made by Sarah Bond of Philadelphia, PA. Your eyes just don't know where to land first! Winner Nancy Yando of Fuquay Varina, NC, made the third place quilt, which if memory serves, was all appliqued and quilted by hand. A bit of a modern twist with Civil War repros! Lovely, don't ya think? In addition to the Just Judie winner quilts, Pati brought along several of the new BOM program quilts to show us. 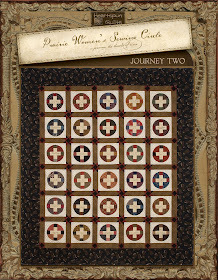 The quilt above is called Mastering Miniatures and is actually a Block of the Week program. 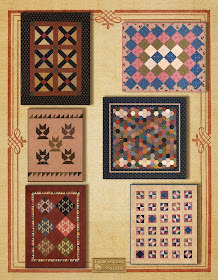 The "miniatures" refer to Judie's new fabric collection called Judie's Authentic Miniatures. Stunning, and L*O*V*E the fabric collection. Once again, the photos just don't do these quilts justice. Aren't they are beautiful? This stunning quilt is the newest design by Paula Barnes & Mary Ellen Robison of Red Crinoline Quilts, called Hampton Ridge. OK...hating to sound like a broken record here, but really! The fabrics and the quilts are just awesome in person. I wanted to take as many close-up photos as I could so you can really see the fabric and blocks. When I really study the blocks in Hampton Ridge, I get that itch that tells me I want to make them all! Does that happen to you? So...look over all the yummy BOM's here to see which ones give you that itch, and be sure to sign up for them at your local quilt shop!! 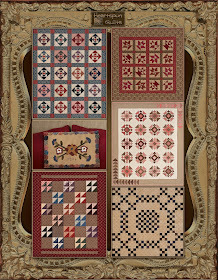 The next collection of quilts are Judie R's. This quilt is her favorite way to showcase Conversation prints. Love the fussy cut stripe border! Pati told us that this is an excellent example of how Judie likes to use "not your typical" fabric in the background of a quilt. Sign....love this one, too! Judy also loves hand piecing, hand quilting, and miniatures. All three are combined in this cutie! What a great way to showcase a toile, don't ya think? Lots to love in this quilt, too. 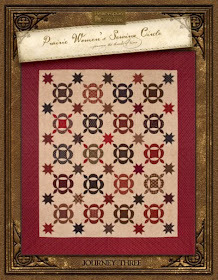 Sigh....it's probably easy to say there are few Civil War reproduction quilts I don't want to make. The problem is that FOUR letter word.....TIME! Apparently, I was lost in the show because there were more Judie quilts I don't have pictures of. Sorry...I was mesmerized! 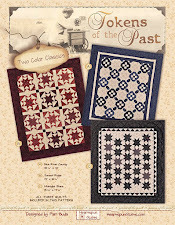 These patterns may be available for purchase directly from Judie's website, Schoolhouse Quilts. 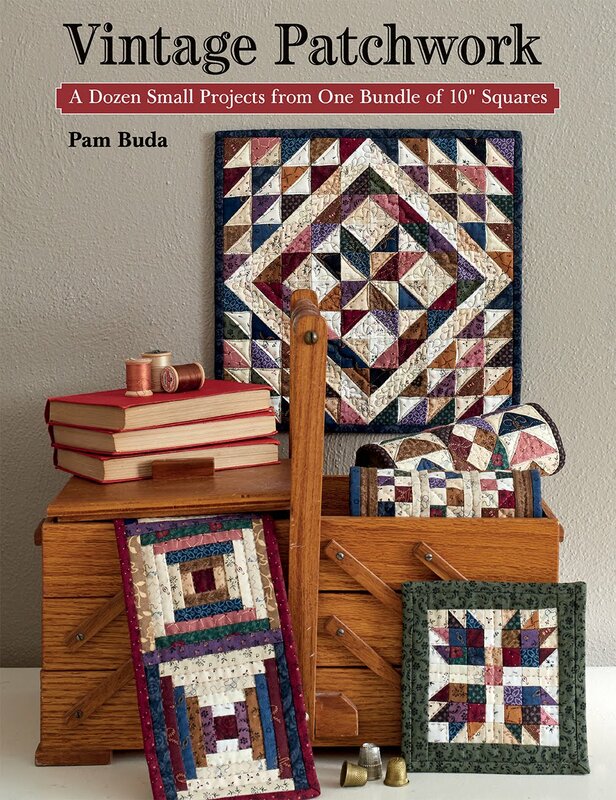 While I may have lost my memory when Pati was showing Judie's quilts, I didn't loose it all when Pati generously handed out packs of Judie's Authentic Miniatures fabric collection, and asked her to give me an extra one to give away! Yay! 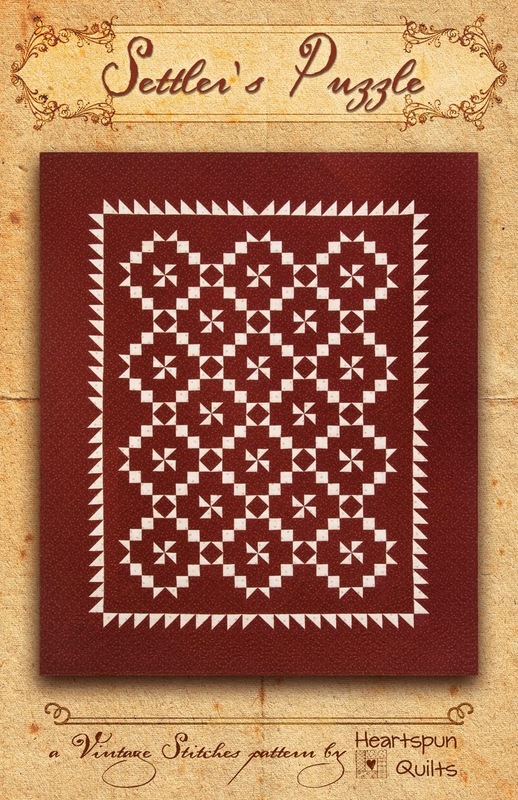 The pack includes an 8 inch square of each print in the line and Judie's instructions on how to make this wonderful block. So.....I'd love to hear your comments about Block of the Month programs. Do you participate in them? How many do you do in a year? What criteria goes into choosing which program you do? Is it the fabrics, the designer, the quilt design, how many blocks you'll be making, the difficulty of the project? Even if you've never done a BOM, let me know why not. I'll choose a winner on Friday morning. Until then....happy stitching! For the past month or so, I've been setting my alarm to wake up really early so I can spend some much needed time with my sewing machine. You'd think that since my job is all about quilts that I'd be piecing and sewing all the time. Wrong! Make no mistake, I love my job and I'm lucky and grateful to get to do what I love, but I really don't get to sew much anymore. I've been missing it terribly. I know that many of you work, take care of the house, the kids, hubby, and often extended family members, volunteer, etc, and don't get to sew much either. There are loads of reasons why we don't get to sew as often as we'd like. I really wanted to change that....to find some time to sew, and it seemed that getting up a zero dark thirty was the best way to make that happen. (I'm a morning person, so that's what suits me. I can't stay up late.) Do you do that, too? I wanted to make a few small quilts as gifts for Christmas. There are several people on my list whom I know would appreciate them. So, in the early morning hours, when the house is quiet, I've been spending time in my sewing room piecing. J*O*Y!! I don't piece a thing unless the fabric has been starched sized first. I'm a big, big believer in sizing or starching yardage. It helps ("helps" is an understatement of epic proportions!!) in all aspects of piecing from cutting, to sewing, to pressing. (I have lots of tips and hints all about this in my Heartspun Quilts Hints book, including how to starch fabric in your washing machine!) I have lots and lots of scraps. You, too?!! I keep my large selection of scraps organized in several ways, and one of them is to keep a big (unorganized!) bag of pre starched sized scraps handy, so I can be ready to sit and sew when I have a few minutes to make units, and blocks, and in this case, little quilts. This morning, I put the last border on the fourth (and final) little quilt I'll be giving as a Christmas present. I'm feeling on top of the world, not only because I've been piecing, but also because I made the four little gifts I wanted to make. Win, win!! I'd like to show you what I made, but the recipients are regular readers of my blog. I think we can all say we never have enough time for all the things we'd like to do. There's a never ending amount of tasks we have in any given day, and if we don't make time to do the things we love, and that make us happy, then we live to work, not work to live. If you're a regular reader of my blog, you may remember that at the beginning of the New Year (2013), I set two goals for myself. The first was to find good soup recipes and make more soups. I love to eat soup, but I didn't have many really good soup recipes. I'm happy to report I've done a fair job of making some good soups this year. The other goal was to learn to make pies from scratch, especially pie crust. I haven't been successful at this....having found no time to even try, and here it is November. All this "not having more time to do the things I love, and that make me happy" got me to thinking how quickly time flies by, and if I (read "we") don't make the time, then what? 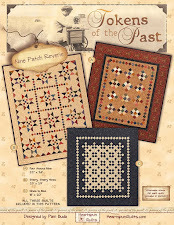 This quilter ain't gettin' any younger! Hence, greeting the crack of dawn at my sewing machine. So, a few weekends ago, I decided enough was enough. It's apple season and I wanted an apple pie! Here's my first attempt at pie crust and apple pie filling from scratch. Not bad. Not good either! Teehee! It looked pretty as a whole pie and as a slice, but it wasn't all that great. My family doesn't agree as they scarfed it up, but I know I'll keep searching for the perfect crust and filling recipes. I am very happy that I took the time to play....to try. It was very good for my soul. So, the moral of the story is, let's try to find time to do the things that make us happy. That lift our spirits and fulfill the soul. 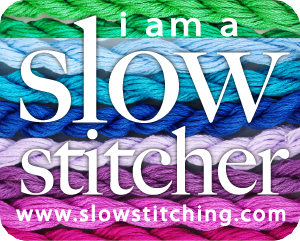 A cup of soup, a slice of pie, and a stitch here and there! It's been a little busy here with all kinds of stuff going on, hence the pause in blog posts. Trust that I have good intentions of blogging everyday, but alas, I'm not always able. In this case, being busy is a good thing! I settled my next fabric line which is due to make its debut in January, and finalized the design of the quilt that will go with it. Very exciting. I still pinch myself, believe me!! All of that designing takes inspiration. In my case, my creativity needs to be fed. Alot! So, when I can I get out to do some antiquing, read about early American life, look through old magazines (yes, old ones!) and of course, get out and about where there's plenty of fabric. This also enables me to feed my stash! A happy two-fer! On my way home from Iowa a few weeks ago, my pal Docia and I made a stop at Inspirations Quilt Shop in Hills, Iowa. When I walked in it was J*O*Y!! As you can see, there's loads of good quilty stuff in the shop. Never mind the display of my American Gothic fabric collection greeting me as I stepped in the door....which did make me smile! I'm hear to tell ya that Inspirations lives up to its name! Owner Nancy Lackender and her family did an awesome job of rehabbing this old building. You can tell they put a lot of thought into what a great quilt shop needs, and you'll find it all inside these walls. While they have something for everyone, they have a large selection of Civil War reproductions, which of course made me a happy shopper! Top it off with really great lighting and a super friendly staff, and you get the feeling you want to stay all day. Upstairs, Nancy created an open, airy classroom. They also feature a rotating trunk show of quilts all made by local quilters! How cool is that?! If you're in the area (not too far from the Amana Colonies ~ another of my favorite haunts) do yourself the favor of shopping at Inspirations! 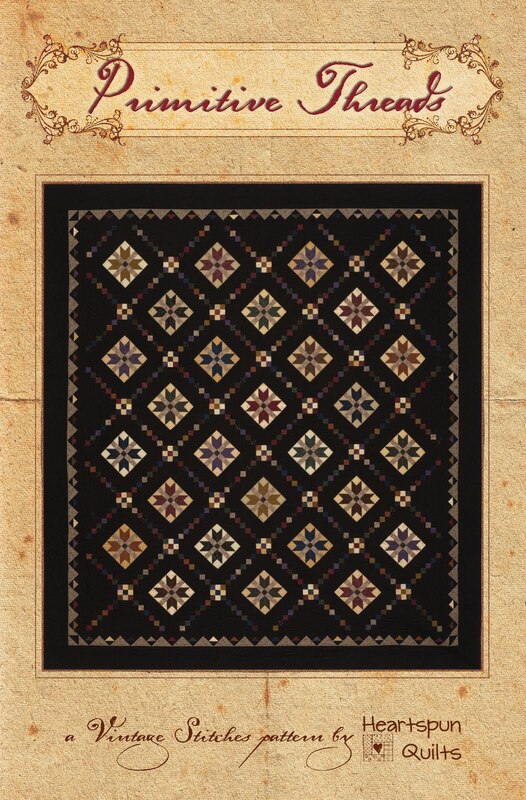 Here's another reminder to send me a photo of your Nabby's Dowry quilt TOP. Remember, it does NOT have to be quilted!! You have until December 1st, so please do email the photo. Everyone wants to see your quilt! !